I recently had the honor of being interviewed but a local blogger who has become a good friend. 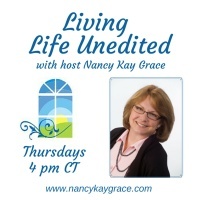 Nancy Kay Grace is an author, speaker and an online radio show host. She recently interviewed me about my favorite aspect of God and how that affects how I deal with living with chronic illness and a disability. I hope you’ll take about 30 minutes to listen! You can find the interview here.